Is Paula Abdul going to Replace Paula Abdul on American Idol! Ahhh....focus groups. Radar online is reporting that Fox is doing focus groups during the American Idol tryouts, to determine if any of the guest judges will rate higher than former judge Paula Abdul! If the groups determine that Ms Abdul is missed...look for a sweet money offer to be made for her return to the show.....or perhaps she needed a longer vacation.....or more so...is this a publicity stunt to garner higher ratings when the show returns? Marcus Schrenker- "Missing" Pilot- Faked His Own Death??? Securities Probe?? Schrenker lived a lavish life as an investment manager and an experienced recreational pilot who performed aerial stunts. He bought luxury automobiles, two airplanes and a $4 million house in an upscale neighborhood known as "Cocktail Cove," where affluent boaters often socialize with cocktails in hand. But in reality, Schrenker's life appeared to be spiraling downward. He lost a half-million-dollar judgment against one of his companies, and his wife filed for divorce. Investigators probed his businesses for possible securities violations. Guinness Rishi Holds Record for downing a bottle of Ketchup in 39 seconds. October 4 is D-Day in the Phoenix area- that is when the Almighty, Great Monolith, Walmart is set to open a small-format (12,000 sq ft) store called Marketside. The first four in the market test will open in Phoenix - putting them in direct competition of Fresh & Easy stores owned by UK's Tesco. 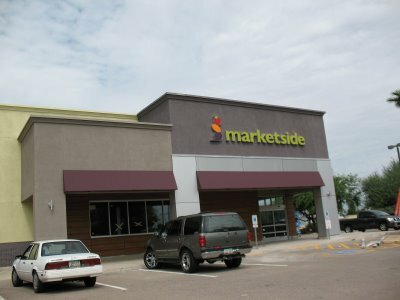 The Marketside stores will draw from the same Walmart Philosophy- Lets push the other guy out, affordable prices on fresh food and prepared foods. Walmart has not unveiled the stores- but spokesfolks say that this is only a pilot program. The logo is supposed to be s a stylized tomato, egg and grape topped by Wal-Mart's signature blue star and will concentrate on convenience, freshness and low price. TV Chef and Cookbook Author Antonio Carluccio Stabs Himself in the Chest with a Butcher Knife! TV chef Antonio Carluccio, is in intensive care in a London Hospital after stabbing himself with a Butcher knife in his home in South London. Authorities haven't been able to determine whether the stabbing, which may have punctured his lung, was accidental, or whether Carluccio was trying to commit suicide. Besides being a TV chef, Carluccio owns a chain of Rustic Italian Restaurants in the UK. 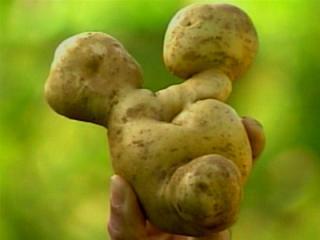 A Fredrick, MD Novice Farmer Unearths a Mickey Mouse Shaped Potato! Novice Farmer Rick Brown was enthused about his eight pound crop of Potatoes, but when he saw that one of his spuds resembled Disney icon Mickey Mouse- he was overjoyed. No word from Disney if they are planning to sue a higher power for copyright infringement of the Mickey Mouse shape. A new breed of grapes, the Ruby Roman went on auction yesterday in Japan, and one bunch (1.5 pounds) was auctioned for $910.00 exceeding the previous high auction price of $249.00. Fruit is generally expensive in Japan, and people often buy grapes, peaches and melons as luxury gifts. Japanese are often willing to pay top prices for high-end fruits, especially for the prestige of owning the very first ones of the year. Makes me look at the fruit a little differently. Anyone know where I can get some Ruby Roman Grape Seeds?